It's been great sharing my foodie faves with The Baron. Part of the reason why it's been so fun is because it's easy to do since we tend to like the same things. One of those things we both like is blue cheese. In fact, it's our favorite cheese! 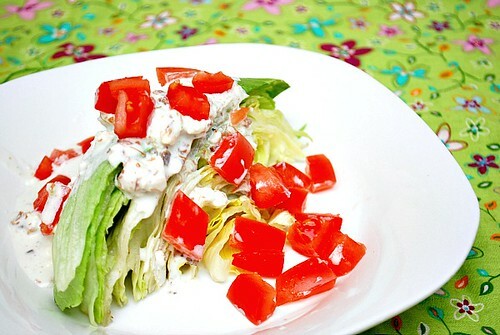 This salad is the perfect way to highlight blue cheese because it's used as part of the salad itself and the dressing. One ingredient that works really well with blue cheese is bacon, which is why I incorporated crumbled bacon in the dressing. And to add some zing, I added a touch of ranch dressing mix for another twist. Overall, it's a delicious dressing that ties everything together... and you just might be encouraged to eat more salad more often! In fact, this salad was one of the ways I enjoyed salad when I was younger. The idea of having a wedge of salad versus a serving of chopped greens seemed more interesting. For Joel, he had a mini wedge the other day with ranch dressing for a kid-friendly version. I was surprised that he seemed to like the way it was presented and he even helped me cut it up. Speaking of kids, please check out Lunch Break for Kids, a national fundraiser (October 15-19) highlighting ways for parents and kids to come together with chefs and schools to learn more about how simple, good food can make healthier bodies and stronger family connections. Hidden Valley Ranch could use your help to support the program and childhood nutrition education! Combine 1/2 pound blue cheese, sour cream, buttermilk, mayonnaise, vinegar, olive oil, sugar, garlic, ranch dressing mix and pepper in a bowl; blend using a hand mixer; chill until serving. Build the salad by placing 1 lettuce wedge on each of 8 plates. 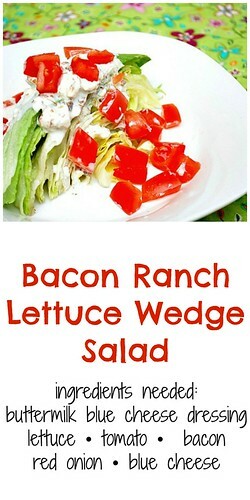 Drizzle equal amounts of dressing over each wedge. Scatter tomatoes, onion, and 1/2 pound blue cheese over each salad. does not affect my thoughts on its company or their product. 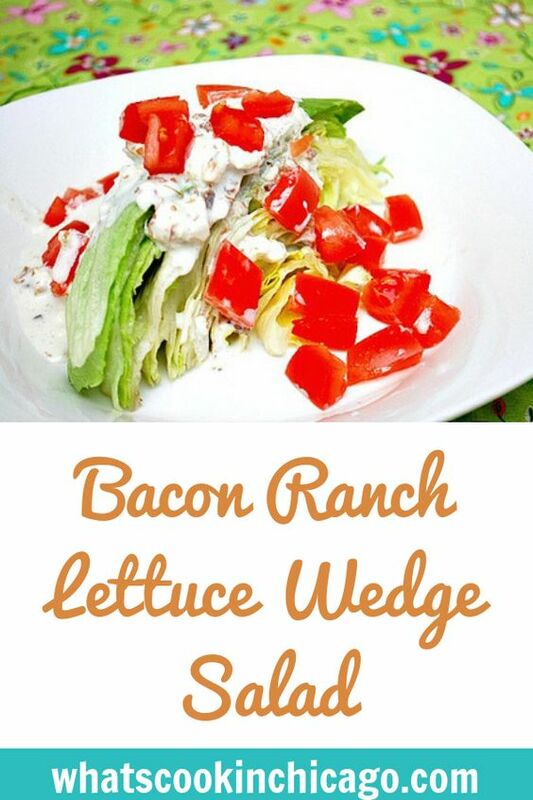 Wedge salad is my husbands absolute favorite salad and yours looks delicious! I make something similar for our (very large) family gatherings. Despite the fact that it's a crowd of people who aren't really into veggies, it always disappears!